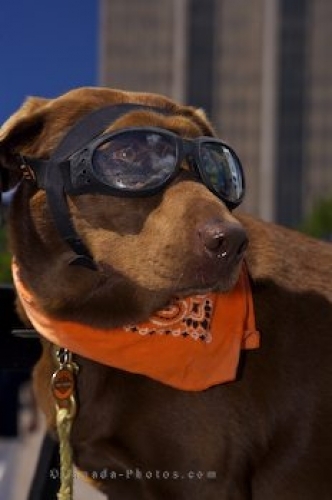 With cool motorcycle glasses adorning the handsome face on this chocolate lab dog, the sky is the limit after leaving the downtown area of Halifax, Nova Scotia aboard a motorcycle. Looking as good as a motorcycle dog can, the breeze will blow by this dog while on the back of the bike without any foreign objects accidentally getting in his eyes. Max the chocolate lab dog, on the back of a Harley Davidson Motor Bike next to the Naval Clock in Chebucto Landing along the waterfront in downtown Halifax, Halifax Metro, Halifax Harbour, Nova Scotia, Canada. Picture of a handsome looking motorcycle dog along the waterfront of Nova Scotia, Canada.